Thomas Prescher: The Ultimate Goal Is To Create Excitement! 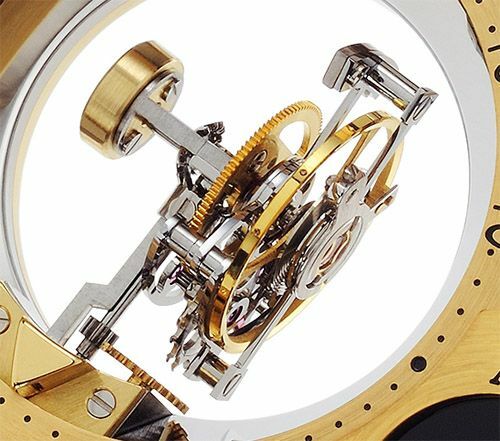 Thomas Prescher did create excitement amongst watch collectors, he created a mechanical timepiece that is absolutely unique. A triple-axis tourbillon movement in a wrist watch. 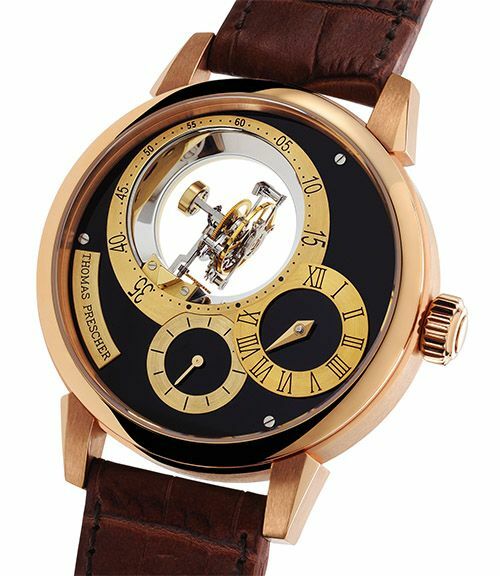 The Triple Axis Tourbillon Regulator, as the watch is being named, is again one of these great inventions of Thomas Prescher, since he started working for himself in 2002 and joined the AHCI in 2003. 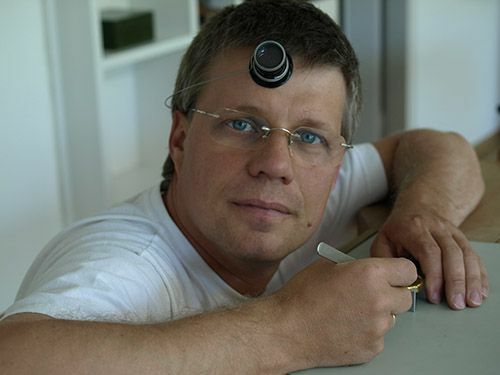 Before 2002, Thomas Prescher followed an appreniceship at IWC, followed by a great carreer at Audemars Piguet where he earned his Master Watchmaker certificate. Just before Thomas Prescher opened his own atelier, he was hired as a Production Manager for another big name in Swiss horology, Blancpain. Tourbillons seem to be the specialty of Thomas Prescher, as he already made a half-flying tourbillon watch during his apprenticeship at IWC. In 2002, he introduced the world’s first double-axis tourbillon with constant force-device. Actually, it was this invention that made him a candidate for the AHCI in 2003. Although I don’t want to neglect his great other collection of time pieces, such as the trilogy comprising single-axes, double-axis and triple-axis tourbillons, Thomas Prescher now introduces his Triple Axis Tourbillon Regulator time piece. This piece of art has a 43mm x 16.5mm watch case in either 18 carat pink gold or platinum (Pt950) and an absolutely stunning dial made out of natural black onyx, 50% thicker than usual onyx dials to guarantee a richer blackness. Of course, the hand made black alligator strap comes with a matching buckle in either 18 carat pink gold or platinum. All very nice and impressive, but the mechanical movement is the object and real piece of art we watch nuts are looking for, of course. So how about it? I am pretty sure you all know the tourbillon basics, since there are a lot of them on the market (lately). Myself, I got a pretty good understanding of them when Bernhard Lederer of BLU watches took the time to explain the tourbillon movement to me during the meeting we had in 2009 at BaselWorld. Thomas Prescher’s tourbillon movements are so-called flying tourbillons, since they only connect to one side. 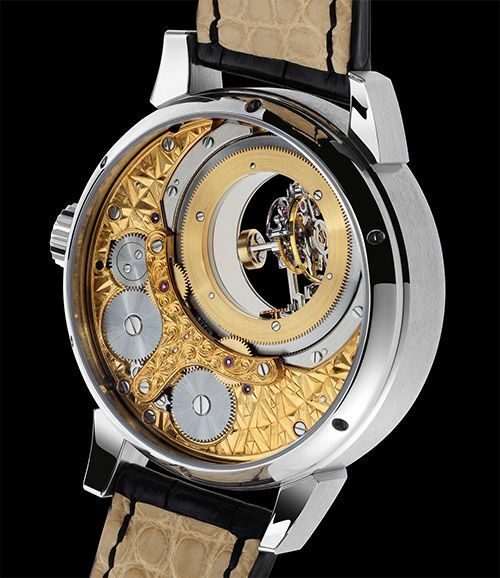 This will give the owner (or admirer) of the time piece a much better and clearer view on the tourbillon mechanism. The triple-axis tourbillon of this new time piece, uses two conical gears to ensure nothing gets in your way of gazing at this beautiful tourbillon construction. See the picture above for a close-up of this magnificent art of work. As you can clearly see on the picture, a counter weight is in place to keep the tourbillon in balance when moving around on all three axes. 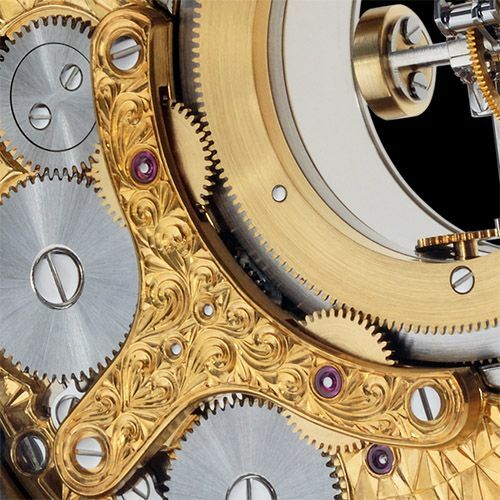 The tourbillon moves one minute on the first axis, one minute on the 2nd axis and 60 minutes on the third axis (as a minutes indicator on the dial). Movement dimension is 37mm x 6.5mm and has a total of 327 parts, including 43 jewels. This movement (caliber TP 3W6A.3) has a power reserve of 40 hours, 2 main spring barrels and ticks at 21.600 beats per hour. Nice detail: the smallest screw in this movement weighs 0.0009 grams. When you turn this watch around, you’ll see a magnificent finish movement. The gold plated brass plates and bridges have turned into true art of haute horlogerie! Below is a picture of the watch in full (seen from the back side) and a blow-up of the incredible detailed perfection of its movement finish. More information about the Thomas Prescher Triple Axis Tourbillon Regulator can be found at the official website. These watches will sell as unique pieces only, prices starting at 525.000 CHF.